Another finding in the main report was that the browser remains more popular than apps for getting mobile news, and its popularity has risen over the last year. Roughly 60% of tablet news users and smartphone news users mostly use the browser for news while about a quarter mostly use apps (the rest use a mix). But, the survey also found that app users tend to be more active mobile news consumers, carrying special appeal for news organizations. The question, then, is whether certain demographic groups have a greater affinity toward apps than others. Education, according to the data, is the biggest factor. 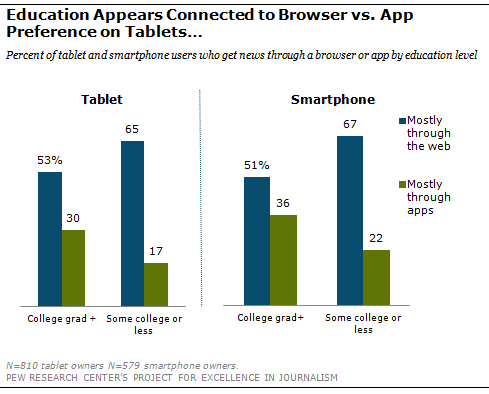 College educated mobile news users are more likely than those the less educated to mostly use apps for news. This is true on both the tablet (30% of college educated mainly use apps for news compared with 17% of the less educated) and on the smartphone (36% versus 22%). Age also seems to influence the app versus browser choice, but only on the phone. There, news users 50 and older are more likely to access their news through apps, 35% versus 26% for those under 50.